Camp Winning Hands is an overnight camping experience for children with congenital hand and upper limb differences, and provides an opportunity for play and exploring in a safe environment. Activities are organized by the pediatric hand teams at UCSF Benioff Children's Hospital Oakland and Shriners Hospitals for Children—Northern California. 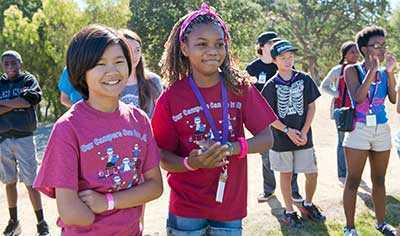 The Taylor Family Foundation hosts the camp in Livermore, California. Camp Winning Hands is both a resource for parents and a place for kids with congenital upper limb differences to be just kids. For children and teens, Camp Winning Hands is an overnight camping experience and an opportunity to play and explore in a safe, supportive environment. 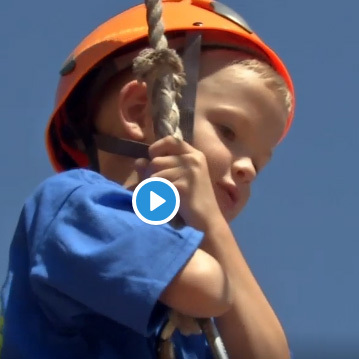 Children attending Camp Winning Hands experience opportunities to challenge themselves and have new adventures in a safe setting where differences seem less special, less limiting, and less important. 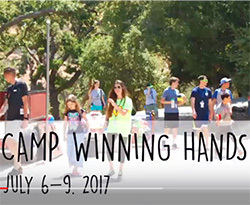 For parents, Camp Winning Hands provides a link to a wider network of families that include children with hand/limb differences. 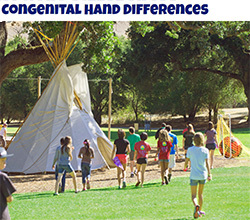 Camp Winning Hands is also an opportunity for parents to be a resource to new parents of children with hand/limb differences and to reinforce the bonds created with camp-families throughout the years. Three to four days full of fun give children and teens the chance to connect, play, and talk with one another. The camp experience fosters strong bonds between children. Activities include a climbing wall, zip-line, archery, sports, arts & crafts, horseback riding, rock climbing, swimming, games and more. Camp Winning Hands is located in Livermore, California. Kids Camp is for children from seven to eleven years of age. Teen Camp serves teens 12- 17 years of age. Each camp is staffed with professionals and volunteers from UCSF Benioff Children's Hospital Oakland, Shriners Hospitals for Children, and Samuel Merritt University (SMU) students who have finished their studies in the Master of Occupational Therapy program. Additionally, many counselors also have hand differences and serve as mentors for campers. "Our volunteers help by creating a supportive and encouraging environment for the kids, along with kid-friendly adventures to empower children with hand differences to address daily physical, emotional and social challenges together," says Ginny Gibson, Senior Occupational Therapist at UCSF Benioff Children's Hospital Oakland and Camp Winning Hands Director. There is no cost for the hand camp; it is partially funded by The Taylor Family Foundation, UCSF Benioff Children's Hospital Oakland, and Shriners Hospital for Children Northern California. The first Camp Winning Hands took place in August 2010 and has since become an annual summer event. ABC News Cheryl Jennings introduces us to some courageous and inspiring people at the Taylor Family Foundation's Camp Arroyo-- a camp for children with developmental disabilities, life-threatening and chronic illnesses such as brain tumors, autism, heart disease, diabetes, pediatric cancers, skin disease, asthma, burn survivors and pediatric HIV/AIDS.